Like most kits, this will get you going but the canvas bag is a stand out in how well made it is! The Milwaukee HACKZALL® Reciprocating Saw is one of the new offerings from the folks who created the Sawzall concept so many years ago. 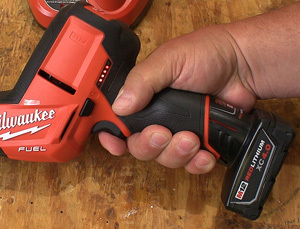 Milwaukee’s M12 FUEL™ battery systems allowed them to create this hand-held powered hacksaw that makes short work of many cutting tasks including those in confined areas. It also is easily taken to the job rather than bringing the work to it. 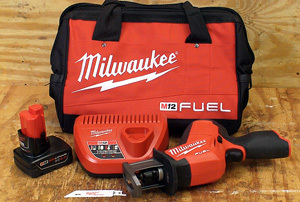 The Milwaukee HACKZALL® Reciprocating Saw Kit (#2520-21XC) shown in this review includes the M12 FUEL™ HACKZALL® Reciprocating Saw (#2520-20) itself, a M12™ REDLITHIUM™ XC 4.0 Extended Capacity Battery Pack 12V (#48-11-2440), a M12™ Lithium-ion Battery Charger (#48-59-2401), a contractor bag and a multi-material blade. At 13.25"-long and weighing just 4.1 lbs. the Milwaukee M12 FUEL™ HACKZALL® Reciprocating Saw Kit is designed to be a one-handed tool which gives the operator exceptional control and versatility. The ergonomically shaped grip area with a rubber over mold makes this tool comfortable to the hand and highly slip resistant. The layout of the tool and its overall compact size makes using it in confined spaces surprisingly easy. 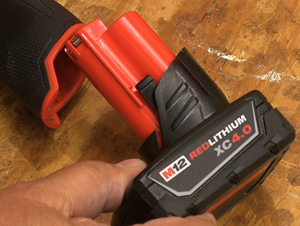 The battery (left) has a stalk-type connector that insures the correct polarity and that it is locked into the tool. The charger (right) is automatic and uses simple lights to keep you apprised of its progress. The Milwaukee HACKZALL® Reciprocating Saw has a LED light aimed at the cutting area of the blade to help hit your cut mark in less than bright environments. The light stays on for several seconds after you release the trigger to help place the next cut more easily. This tool has a stroke length of 5/8" and uses the QUIK-LOK® Universal blade design with a keyless blade clamp. The variable speed trigger lets you use the right blade speed for the job within the 0 to 3,000 SPM (strokes per minute) range. Equipped with a POWERSTATE™ Brushless Motor performance is consistent throughout a battery charge. Being brushless means it eliminates the service problems for heavy users of finding and replacing the old style brushes. 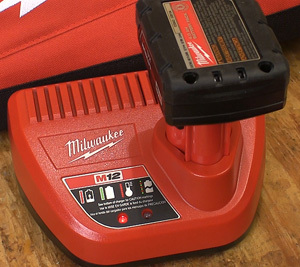 In addition to the M12™ REDLITHIUM™ XC 4.0 Extended Capacity Battery Pack you get the Milwaukee M12™ Lithium-ion Battery Charger that automatically freshens a discharged pack in about 30 to 45 minutes depending on the charge state of the pack. This is an 115V charger that uses a simple graphic and light system to keep you informed of the charging progress. The Milwaukee HACKZALL® Reciprocating Saw has a light array just above the grip area that shows the charge state of the battery pack. Milwaukee’s REDLINK PLUS™ Intelligence optimizes performance and overload protection through what they call a total system communication between tool, battery and charger. The good news for us is that this all happens in the background and does not require you to know anything special about electronics! I’ve been a life-long fan of the Milwaukee Sawzall so when I saw the Milwaukee HACKZALL® Reciprocating Saw I had to get one. The idea of a one-handed powered hacksaw makes a bunch of sense, particularly for the person doing a job alone or in a confined area. Another plus for me is Milwaukee’s solid reputation for making good tools. 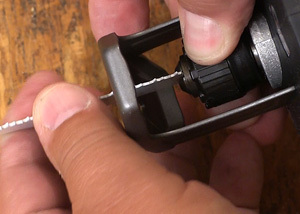 Blade changing (left) is a simple twist away. Very easy and very secure. The grip and controls (right) are logical, work well and the tool feels very comfortable to the hand. I was a little concerned by the shape of the Milwaukee HACKZALL® Reciprocating Saw as it looks like it could be front heavy but that turned out to be wrong. They did a good job of balancing the Milwaukee HACKZALL® Reciprocating Saw and putting the blade at a natural angle in relation to your hand. That makes it easy to use, less tiring and your cuts more accurate. The no tools blade system is becoming standard fare these days but with Milwaukee’s extensive line of blade designs your blade style options are nearly endless. Plus this style of blade is available at virtually any home center or hardware outlet. If there is an easier way to change blades than Milwaukee’s twist system I have not seen it. Short of having someone else change the blades for you this system is the easiest and most secure that I have used. The power of the brushless motor allows the Milwaukee HACKZALL® Reciprocating Saw to cut tough material easily without you having to lean on it. Set it where you want the cut start slowly and then you can add power/speed by pulling the variable speed rigger a little further. The shoe that is held against the material is generously sized and does a good job at keeping the cutting action smooth and preventing kickbacks. This shoe does not pivot as they do on larger tools but the Milwaukee HACKZALL® Reciprocating Saw does not need that. The shoe makes it easy to keep the tool square to the material so you can let the Milwaukee HACKZALL® Reciprocating Saw do its work and power through the cut. Throughout my evaluation the Milwaukee HACKZALL® Reciprocating Saw performed perfectly. I cut wood and plastic with the included blade easily. I installed a metal cutting blade and the Milwaukee HACKZALL® Reciprocating Saw powered through steel tubing just as easily. Changing blades is a snap when you do need to replace one. It is more likely that you will change to a different style blade for a new job than to replace a worn out blade. The Milwaukee HACKZALL® Reciprocating Saw seems to work so easily that I never felt like I had to apply pressure to make a cut. That reduces heat and abnormal wear which lets the blade work much longer. The Milwaukee HACKZALL® Reciprocating Saw is a nicely designed, well-made tool from the folks who made contractor tools what they are today. I like that this tool has all the features we need and none of the fluff that only drive up the price. The Milwaukee HACKZALL® Reciprocating Saw kits shown here is selling on the street for $199.00 (6-3-2014) which is not bad for the tool, battery, charger and a very nice canvas carry bag that keeps all of the components together and safe. If you cut smaller diameter tubing, pipe and many other materials the Milwaukee HACKZALL® Reciprocating Saw is meant for you. Of course if you own a home the Milwaukee HACKZALL® Reciprocating Saw probably has more DIY uses than we think. This is a very good idea that performs great. Have a comment on this review? –Email Me! All NewMetalworker.com drawn,written, photographic and video materials are property of and copyright by NewMetalworker.com and NewWoodworker.com LLC 2001-2019. Materials may not be used in any way without prior written permission from the owner.